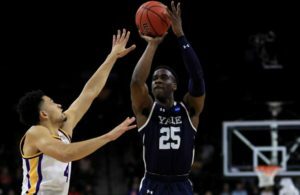 The Yale basketball season ended in the Bulldogs’ first round NCAA Tournament loss to LSU on March 21st, but for Miye Oni, the Ivy League Player of the Year, there has been no letup in pressure. Oni must soon decide whether he will forego his last year at the prestigious institution in favor of declaring for the NBA draft. If he goes that route, he would not graduate with his class from one of the nation’s, even world’s most prestigious educational institutions and may possibly never get that prized Yale degree. On March 27th, the student paper, The Yale Daily News, published an open letter to Oni urging him not to go the “play for pay” route. 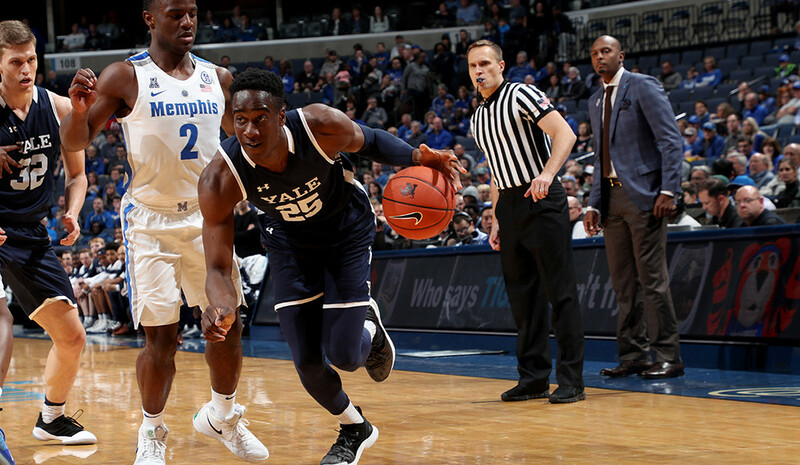 The reasons given, both serious and in jest, support the feelings of the writer, Matthew Mister, a self-described Yale basketball fan, and presumably others in the university sports community. Olumiye Oni (that’s his actual but hardly known real name) was born on August 4, 1997, and raised in Porter Ranch, Calif. His parents, Oludotun and Opeyemi Oni, are from Nigeria. His father is a professor at the Univ. of Phoenix and is an engineer. He has an older sister, Oluwatoniloba, who attended Cornell. His early schooling was at Viewpoint (Calif.) High School followed by a post-grad year at Suffield Academy, a private boarding school in Suffield, Conn.
By the end of May, Oni could become become the first Ivy League player to be drafted since Jerome Allen of Penn was taken in the second round in 1995, the 49th overall pick of the Minnesota Timberwolves. He later coached the Quakers and is now an assistant coach for the Boston Celtics. It must be said that Allen has been embroiled in the recently uncovered college admission scandals. Oni has said very little about his next move. Perhaps he doesn’t know himself. 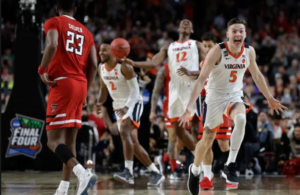 However, one hint of how he is thinking came after Yale lost to LSU in the opening round of the NCAA Tournament, when he was held to five points. Those two words, “most likely,” may be what Yale followers and Matt Mister, the Yale Daily News reporte-fan are pinning their hopes on. Oni is a 6-foot-6, 210-pounder. This past season he averaged 17.6 points, 6.3 rebounds, 3.5 assists, and 1.3 blocks per contest. He was 39 percent successful in 3-point attempts. What coach would not want him in the lineup, especially now that he will have had three years of college experience by the start of next season. Most pro prospects declare after one, two, or at most three seasons. But the Ivy League is different. Yale is different. Yale is…well, Yale. Those who matriculate there do so mainly for a quality education leading to a valuable-for-life Yale degree. They are not there as a training ground for a career in professional sports. “Oni’s length, strength and agility on the wing have made him a prospect teams have scouted heavily this season, and he boasts a solid all-around game to go with it. In addition to a basic, effective spot-up game, he’s a solid passer, rebounder and shot-blocker who contributes across the box score. He moves his feet well defensively and should be able to stay with bigger wings. Though he isn’t a prolific shot-creator, Oni doesn’t have any glaring holes in his skill set, either. Granted, the leap from the Ivy League is steep, but Oni’s athleticism won’t be in question and will be considered in the second round. If he continues improving as a shooter, he could stick. The highest evaluation comes from The Athletic, which has Oni going No. 39. Aram Smith’s NBADraft.net mock has him as the No. 78 player in his top-100 prospects list. ESPN’s Draft Board has him as the No. 9 shooting guard and No. 51 player overall. Bleacher Report gives Oni the No. 73 selection. 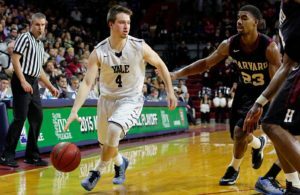 The Yale Daily News writer points out how strong Yale will be with another year of Oni, Jordan Bruner, and 3-point shooting specialist Azar Swain, plus several others who were denied much playing time this season due to the strength of the roster. Getting away from basketball itself, he points out the non-sports attractions of being a student at Yale- great restaurants, off campus clubs, such as Toad’s, and social events. “Being a Yale senior is way cooler than being an NBA player. If you stay, you can join a senior society, which the NBA does not have. If you leave for the NBA, you will miss Spring Fling, beach week at Myrtle, senior week and so many other Yale functions. In case all the other arguments are not enough, Mister ends with the final thrust. “I recognize that you could make a ton of money in the NBA, but we really need you in New Haven next year. Oni had a golden opportunity to maintain and even increase his value in March Madness. But he could not capitalize. 3) withdraw from consideration and return to school for another year of college ball. The last option, and what we predict he will do, should be Oni’s best course. If he goes that way, it would probably make most Yale fans happy, not the least of which should be Matthew Mister of the Yale Daily News!